Blessed Mary’s first action after God had come to dwell in her was one of self-denying charity. She undertook a troublesome journey in order to visit her cousin Elizabeth. Thus she proclaimed charity to be the virtue which above all Christ brought with Him from Heaven. God made Mary’s visit the occasion of a wonderful miracle. On her entrance into St. Elizabeth’s dwelling, St. John Baptist was cleanssd from sin in his mother’s womb. Mary was the channel of this exceptional privilege~ of the cleansing away of sin in the case of the unborn child. As then, so now: Mary is the channel of all graces, and above all, of the restoration of the sinner to friendship with God. Mary’s’ charity is not less present now than at the time of the Visitation. Nay, she is far more eager now than then to promote the happiness and console the sorrows of those who fly to her for succor. Ember Friday in Advent was the original date for this feast. 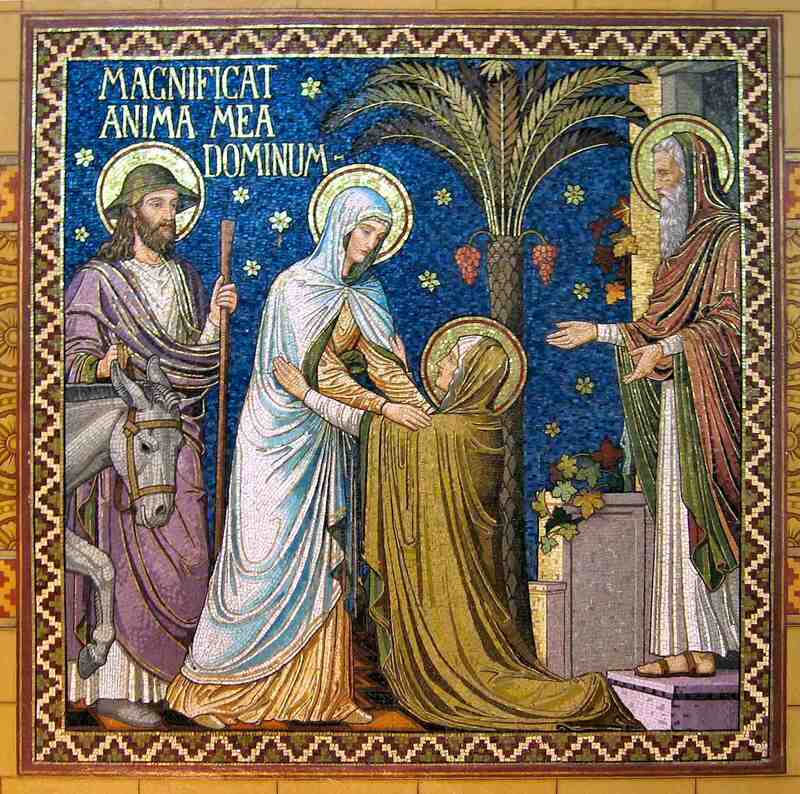 The celebration by the Greeks on July 2nd of the placing of the robe of the Blessed Virgin in the Basilica of Blachernae (A.D. 469) became in the Latin church the commemoration of the visit of Mary to the home of Zachary and Elizabeth. It was kept by the Franciscans as early as 1263; the Council of Basel (1431) made it a holy day of obligation. In honor of this mystery, St. Francis de Sales instituted the order of the nuns of the Visitation. The original design of this kindly saint was that the nuns should imitate the Blessed Virgin in her charitable assistance in the house of her cousin, who, though well advanced in years, was miraculously about to become a mother. Providence, however, thought fit to alter the plan while still in the hands of the designer, so that the latter was accustomed jestingly to say that he had made something which he had never intended to make, whereas he could not make that which he would in reality have wished to have made. Impart unto Thy servants, we beseech Thee, O Lord, the gift of Heavenly grace, that to us, to whom the childbirth of the Blessed Virgin hath been the beginning of salvation, the votive solemnity of her visitation may bring an increase of peace. Through our Lord Jesus Christ, Thy Son, Who liveth and reigneth with Thee in the unity of the Holy Ghost, God, Forever and ever. R.Amen. Grant us, we beseech You, O Lord, that the course of the world may be directed according to Your rule in peace and that Your Church may have the joy of serving You undisturbed. Lesson from the Book of Wisdom. Behold He cometh, leaping upon the mountains, skipping over the hills. My beloved is like a roe or a young hart. Behold He standeth behind our wall; looking through the windows, looking through the lattices. Behold, my beloved speaketh to me, Arise, make haste, My love, my dove, my beautiful one; and come. For winter is now past, the rain is over and gone, The flowers have appeared in our land, the time of pruning Is come, the voice of the turtle is heard in our land: the fig-tree hath put forth her green figs, the vines in flower yield their sweet smell. Arise my love, my beautiful one; and come. My dove in the clefts of the rock, in the hollow places of the wall, show Me thy face, let thy voice sound in My ear; for thy voice is sweet, and thy face comely. At that time, Mary rising up, went into the hill country with haste, into a city of Juda. And she entered into the house of Zachary, and saluted Elizabeth. And it came to pass that when Elizabeth heard the salutation of Mary, the infant leaped in her womb. And Elizabeth was filled with the Holy Ghost: and she cried out with a loud voice, and said, Blessed art thou among women, and blessed is the fruit of thy womb. And whence is this to me, that the mother of my Lord should come to me? For behold, as soon as the voice of thy salutation sounded in my ears, the infant in my womb leaped for joy. And blessed art thou that hast believed, because those things shall be accomplished that were spoken to thee by the Lord. And Mary said, My soul doth magnify the Lord; and my spirit hath rejoiced in God my Savior. Blessed art thou, O Virgin Mary, who didst bear the Creator of all things; thou didst bring forth Him Who made thee, and remainest a virgin forever. Let the humanity of Thine only-begotten Son succor us, O Lord, that He, Who, born of a virgin, did not diminish, but consecrated, the virginity of His mother, may, on this solemn festival of her visitation, deliver us from our sins and make our offering acceptable, even Jesus Christ our Lord, Who with Thee livest and reignest, in the unity of the Holy Ghost, God, Through our Lord Jesus Christ Thy Son our Lord, Who liveth and reigneth with Thee in the unity of the Holy Ghost, one God Forever and ever. R.Amen. Be appeased, we beseech You, O Lord, by accepting our offerings, and in Your kindness make even our rebellious wills turn to You. O Mary, ever Virgin, who because of thy great worth, God set up as Queen of the whole world, pray for our peace and salvation, for Thou hast brought forth Christ the Lord, the Savior of us all. We have received, O Lord, the votive sacrament of this annual solemnity; grant, beseech Thee, that it may afford us a remedy both for temporal and for eternal life. Through our Lord Jesus Christ, Thy Son, Who liveth and reigneth with Thee in the unity of the Holy Ghost, God, For ever and ever. R. Amen. May the sacrament we have received cleanse us, we beseech You, O Lord, and by its grace protect us. PROPER LAST GOSPEL Luke 5:1-11. At that time, while the crowds were pressing upon Jesus to hear the word of God, He was standing by Lake Genesareth. And He saw two boats moored by the lake, but the fishermen had left them and were washing their nets. And getting into one of the boats, the one that was Simon’s. He asked him to put out a little from the land. And sitting down, He began to teach the crowds from the boat. But when He had ceased speaking, He said to Simon, Put out into the deep, and lower your nets for a catch. And Simon answered and said to Him, Master, the whole night through we have toiled and have taken nothing; but at Your word I will lower the net. And when they had done so, they enclosed a great number of fishes, but their net was breaking. And they beckoned to their comrades in the other boat to come and help them. And they came and filled both the boats, so that they began to sink. But when Simon Peter saw this, he fell down at Jesus’ knees, saying, Depart from me, for I am a sinful man, O Lord. For he and all who were with him were amazed at the catch of fish they had made; and so were also James and John, the sons of Zebedee, who were partners with Simon. And Jesus said to Simon, Do not be afraid; henceforth you shall catch men. And when they had brought their boats to land, they left all and followed Him.